Happy birthday, Canadarm2! 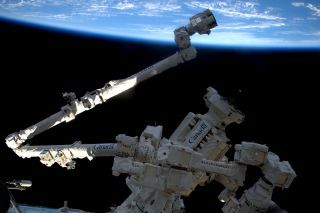 A Canadian-made robotic arm affixed outside the International Space Station turns 16 years old today (April 24). Canadarm2, also known as the Space Station Remote Manipulator System (SSRMS), arrived at the orbital outpost with mission STS-100 aboard the space shuttle Endeavour on April 19, 2001. Five days and two spacewalks later, Canadarm2's installation was complete. Canadian astronaut Chris Hadfield and NASA astronaut Scott Parazynski spent nearly 15 hours installing Canadarm2 during STS-100. Since then, the arm has been moving around the outside of the space station, handling heavy payloads and occasionally assisting astronauts with about 100 spacewalks, all in the name of space station assembly and maintenance. Astronauts at the space station now use Canadarm2 to grab and dock incoming spacecraft like Orbital ATK's cargo-resupply ship SS John Glenn, which arrived at the space station on Saturday (April 22). Sometimes, flight controllers on the ground in Houston will operate Canadarm2 remotely, like when the arm was used to relocate a docking adapter in between two spacewalks last month. The 58-foot-long (18 meters) arm is one of three robotic components that now make up the space station's Mobile Servicing System, along with a robotic "hand" known as Dextre and a base platform known as the Mobile Remote Servicer Base System (MBS). The MBS allows Canadarm2 and Dextre to move around the outside of the space station's main truss structure "by sliding along a track system mounted along the entire width of the station," the Canadian Space Agency wrote in a description. "Sometimes, when looking out the window, the best view is not on Earth but on the International Space Station itself," European Space Agency astronaut Thomas Pesquet wrote when he tweeted this photo. "The robotic arm casts a shadow on the solar array, while the rest of our home space is shrouded in darkness." Canadarm2 may be orbiting roughly 250 miles (400 km) overhead, but you can get firsthand experience with the teenage robot via the Canadian Space Agency's cool Canadarm2 Simulator, an online game in which you control the robotic arm during a mock mission at the space station.